I’m pretty sure mussels come nestled in those cute little spoon-like shells for a very specific reason — to help you slurp up every last bit 0f the delicious broth they were just swimming in. 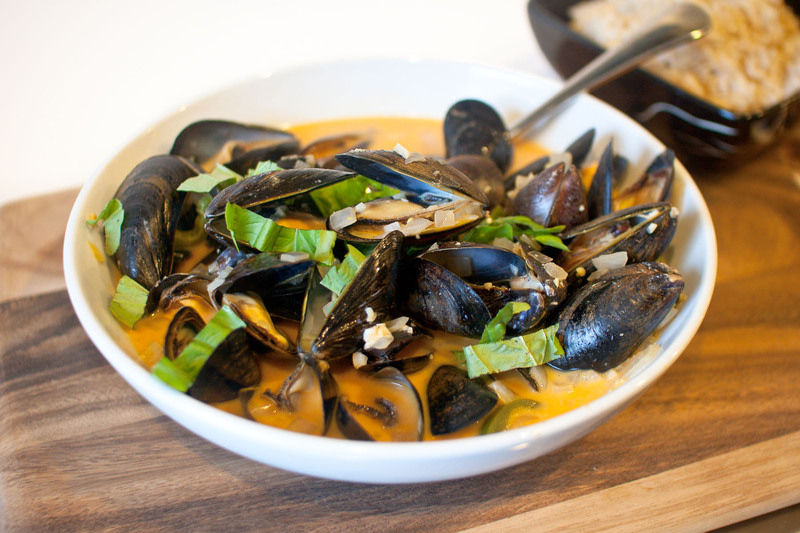 When it comes to mussels, broth is definitely king. And this is a really good broth — sweet, spicy and creamy. I usually make Belgian-style mussels, but when I found this recipe while flipping through one of my mother-in-law’s Cooking Light (!!!) magazines over the holidays, I knew I had to try it. As far as broth soaker-uppers go, I skipped the traditional baguette and frites — neither seemed right here. So I made coconut brown rice, which I figured would be an equally good substitute. And it was. So gather ’round some friends, pull up a seat and prepare to get a bit messy. These mussels are really, really good. In a large Dutch oven, heat oil over medium-high heat. Add onion, ginger, garlic and jalapeno and cook for three minutes, stirring frequently. Stir in curry paste and cook for 30 seconds or so, stirring constantly. Add coconut milk, wine, brown sugar and salt, bring mixture to a boil and cook for two minutes. 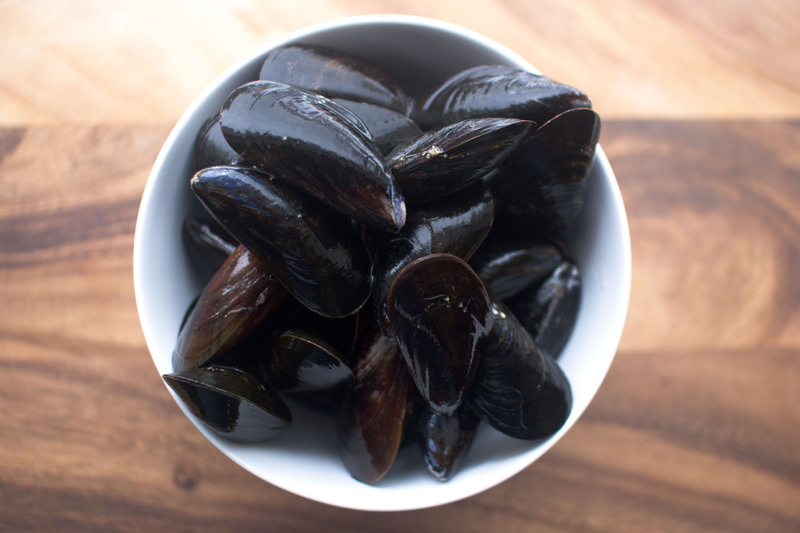 Stir in mussels, cover and let cook for five minutes allowing the mussels to open. Discard any that remain closed. Remove from heat and stir in basil and lime juice. I like serving mussels in a communal bowl with all the broth poured on top, but you could divide them into separate bowls if you wanted to. Serve with lime wedges. Using the back of a large knife, pound the ginger until it starts to break down slightly. This will take a good whack or two. Rinse the rice in a strainer under cold running water for 30 seconds to remove some of the extra starch. Transfer the rice to a medium saucepan and add the coconut milk, cold water and salt. Add the ginger to the pan and stir well, making sure the ginger is fully covered by the rice. Place the pan over high heat and bring the liquid to a boil. Stir constantly to prevent the rice from scorching. Allow the rice to boil for 15 seconds. Reduce the heat to medium-low and simmer, covered, until the liquid is completely absorbed and rice is tender, about 45 minutes. Remove the pot from heat; allow the rice to continue to steam, covered, for 10 minutes. Fluff rice with a fork and remove the hunk of ginger before serving. This looks great! Mussels are one of my fave easy dishes to make- We did them last year for a stay-at-home Valentine’s dinner. I’ve never considered swapping the carb element, but makes sense for the this version. I really wish I was eating this right now. Gotta put this on my “to make” list! I am starving for this right now! 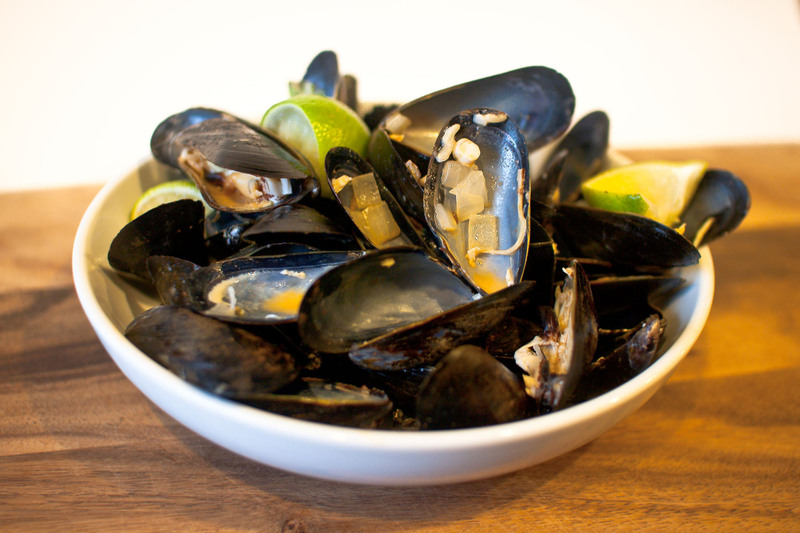 I love mussels and this recipe sounds delicious!